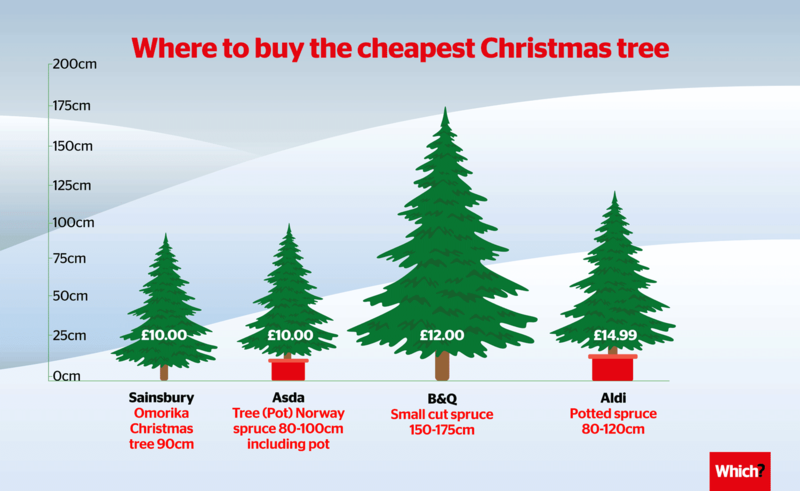 Where can you buy the cheapest Christmas tree? A Christmas tree is the centrepiece of the season’s festivities, but you don’t have to blow your budget if you want a real one. We’ve rounded up the lowest prices on offer from major supermarkets, DIY stores and garden centres. 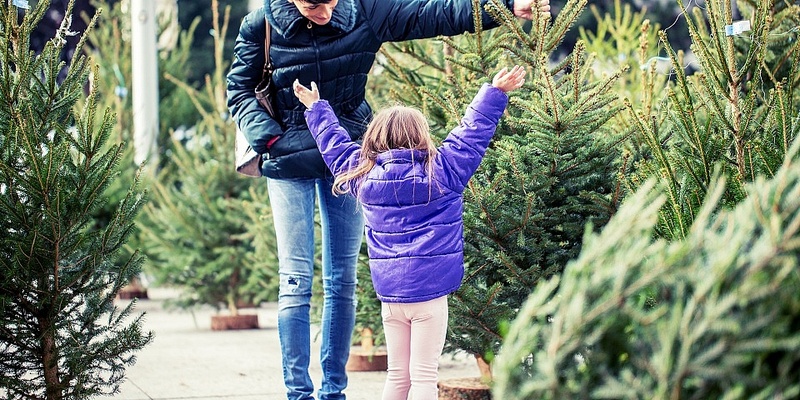 There are two retailers that top the Christmas charts this year with the cheapest trees. For just £10 you can pick up an Asda Norway Spruce 80-100cm tall, or a Sainsbury’s Omorika Christmas tree at 90cm. If you’re willing to pay a little more, you can upgrade to a Norway Spruce measuring 150-175cm. B&Q is selling one for £12, Aldi for £14.99 and Morrisons for £15. The Norway Spruce tends to be cheaper than other varieties and has soft foliage, which can make decorating less prickly. However, they are prone to dropping needles. This makes the Nordmann a popular alternative, as they tend to be cone-shaped with great needle retention. 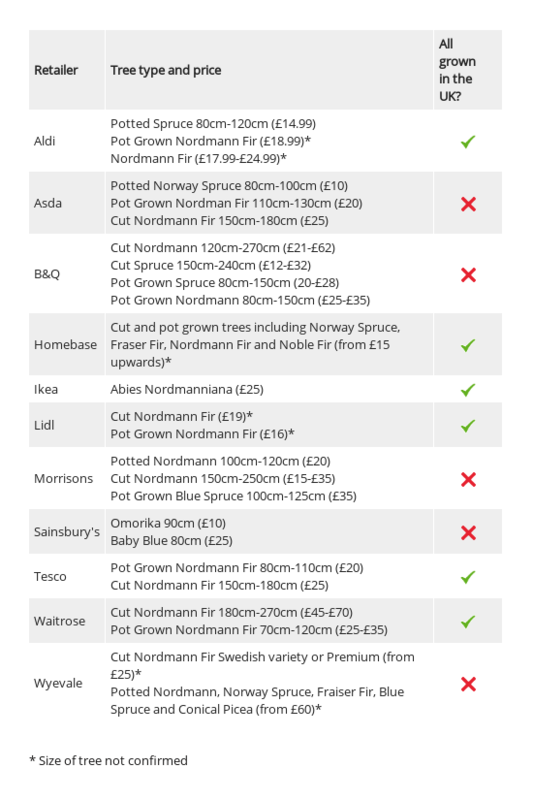 We found Nordmann trees starting at £15 from Morrisons and £17.99 at Aldi. It’s also worth looking into retailer Christmas tree deals. If you buy a real Christmas tree from Ikea for £25, you get a £20 voucher to spend in participating stores between 14 January 2019 and 3 March 2019. This may come in handy if your New Year’s resolutions involve updating your home furnishings. Keep reading to find out the results of our full Christmas tree pricing analysis, and for expert advice from Which? Gardening magazine on how to choose a Christmas tree and make it last. Are you ready for a Best Buy Christmas? From mince pies and Christmas puddings to sparkling wines, Which? is here to help. How much are retailers charging for Christmas trees? We asked 11 retailers to tell us about their cheapest Christmas trees. In our table, below, we’ve rounded up pricing information, tree type and where the trees were grown. Aldi, Homebase, Ikea and Waitrose confirmed that all of their trees this season have been grown in the UK. Homebase says its trees are delivered from field to store in as little as 48 hours. It’s also possible to pick up a bargain novelty tree. 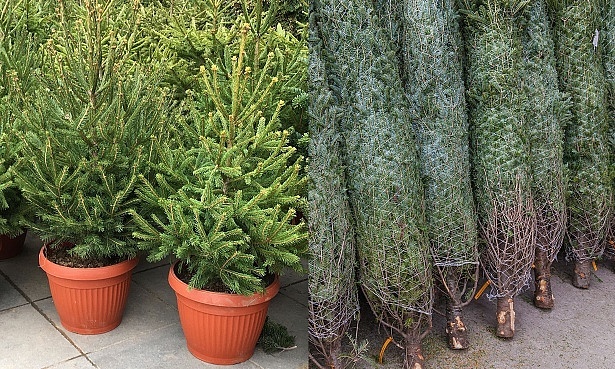 Lidl is selling a 70cm Picea Glauca in a jute sack for £7.99, and Tesco has a 45cm gift-wrapped Picea with seasonal decorations for £6. We haven’t included these in our table, as we’ve classified them as miniature trees. For expert advice from Which? Gardening, take a look at our guide on how to choose a Christmas tree. Cut trees are field-grown and then sawn off at ground level. Potted trees are dug up and potted, destroying most of their roots in the process. We would advise you to avoid potted trees where possible, as they can be hard to look after and watering is tricky if they are rammed into tight pots. Container-grown trees are grown and sold in a pot. Although more expensive initially, they can be a long-term investment, as you should be able to keep the tree in your garden for two or three years. It’s also important to make sure you choose a fresh tree. The British Christmas Tree Growers Association says: ‘A fresh tree will have a healthy green appearance with few browning needles. If you’ve decided on a real tree this Christmas, keep reading to find out how best to care for it. What tree will you get? Tell us what type of tree you will be buying in our poll. What type of Christmas tree will you have? Will you be opting for something traditional or experimenting with a space-saving alternative? Or perhaps you prefer an artificial tree that’s snow-dipped or even multi-coloured? If you can’t see the poll and you’re reading on a mobile, click here. Asda, B&Q, Morrisons and Waitrose have been selling Christmas trees from mid-November onwards. If you plan on rocking around your Christmas tree all season long, make sure you follow Which? 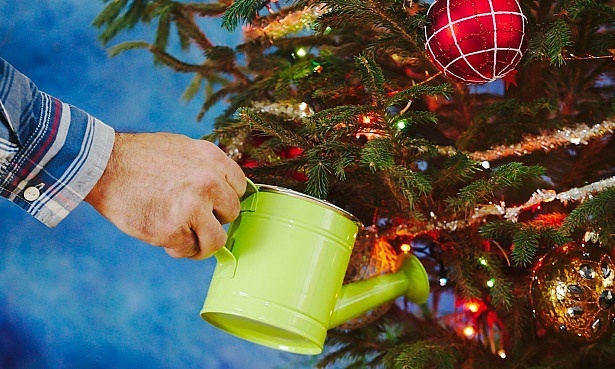 Gardening magazine’s top tips for caring for your Christmas tree. If you’ve bought a cut Christmas tree, saw the bottom 3cm off the trunk and stand the tree in a bucket of water, somewhere that’s not too warm. Make sure it’s clamped securely into a stand that has a water reservoir. Got a potted tree? Water it regularly but don’t leave it sitting in water. Ice cubes are a handy way to keep the roots cool. Keep your Christmas tree in a cool part of the room, away from radiators. Feeling green-fingered after caring for your Christmas tree? Follow Which? Gardening’s advice on gardening jobs for December. Which? Gardening expert Adelaide Gray says: ‘The Norway Spruce has a stronger scent than the Nordmann Fir. Other trees with a pleasant pine aroma include the Noble Fir and the Scots Pine. Real trees undoubtedly bring Christmas cheer with their festive aroma, but they can also result in the regular hoovering of pine needles. If a strongly scented Norway Spruce is on your Christmas wish list, take a look at our Best Buy cordless vacuum cleaners to make light work of clearing up pine needles. 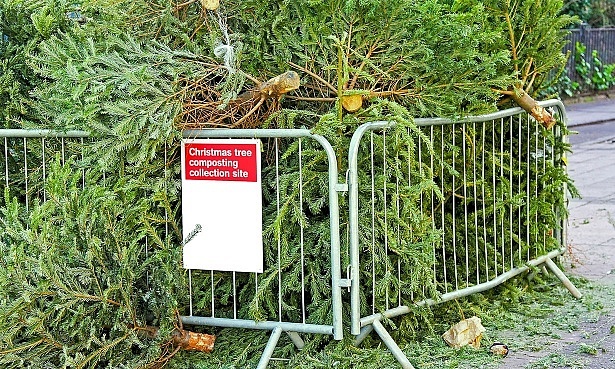 Real Christmas trees can be recycled and shredded into chippings that can be used in parks and woodland areas. Many local authorities will arrange special collections or will set up drop-off points. Make sure you check your local authority’s website for details. Some garden centres offer drop-off points, too. If you’ve got a garden shredder, you can recycle your tree yourself. The chippings can then be used as a mulch for acid-loving plants such as blueberries or rhododendrons. Find out how to get the most from your garden shredder.